Computers have become the primary tool in any workplace let alone in the Media Industry, without computers society would almost certainly collapse. Even on a social level, computers and the internet have played a massive part in the way we communicate. During March 2010, the amount of fits on Facebook overtook Google in the US for the first time, with a rise of 185% on the same week in the previous year compared to a 9% rise for Google (Nick Clark, The Independent 18th March 2010) other statistics can also point to a figure of 400 million in March 2010 compared to 20 million in April 2009 for Facebook according to Hitwise (Carrie-ann Skinner, Network World, 18th March 2010). Together they contributed to around 14% of hits in both the US and the UK. The principle of a computer being a programmable machine is not a new idea, water clocks have been round since ancient times, being developed in Greece, Arabia and India. 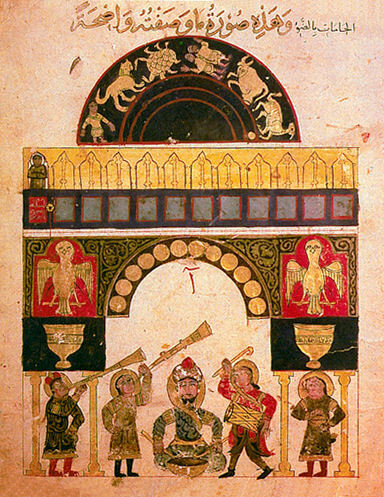 The Monumental water-clock designed by Badi’ al-Zaman Abu-‘l-‘Izz Ibn Isma’il Ibn al-Razzaz al-Jazari, was one of the first time keeping devices, not only would it keep the passage of time from hour to hour, it would also record the phase of the moon and serve a drink from a reservoir. Arabic science and mathematics have played a major influence in the fundamentals of computing, Leonardo Fibonacci introduced the Indo-Arabic numeral system in 1202 in his book The Liber Abaci, this numeral system was far simpler than traditional Roman numerals for multiplication and division, and this breakthrough has been important to the development of binary. The concept of nothing in a mathematical sense is also important for computing. As computers work on either true or false, as 1’s or 0’s. The number 0 was invented by an Indian astronomer named Aryabhata, among other things he manged to calculate the value of Pi to 4 d.p. and suggested the Earth spins on its axis. In programming languages the numbers start at 0, which is important for the use in arrays. However causes problems when we start to think of numbers in terms of nth value, with 0 as the 1st term, the 15 would be the 16th term, therefore zero has to be thought of as the zeroth term. It is ultimately up to humans to provide the laws that computers will abide to, setting up a foolproof system, this is ultimately down to understanding how human’s function and making decisions, after all our own moral code is based on a set of boundaries; rules; exceptions; decisions and processes. The future of computing may be based on an organic model with the ability to adapt and act on new information based on learning and current situations, simply the future of computing is not artificial intelligence, but actual intelligence.